Effects pedals are really fun to use. They open up a whole new world of possibilities, whether you’re using them with an instrument such as a guitar, or with your voice. Besides your standard overdrive and distortion pedals, flanger, phaser, delay, and other types, there is the looper pedal. While it’s probably the hardest one to master, it’s the effect that gives you pretty much unlimited possibilities. But what’s the best looper pedal you could get? In this article, we will go over some of the most important specs and features you should look for, as well as looper pedal reviews of the best models currently on the market. When does a looper pedal come in handy? First of all, let’s take a closer look at what exactly a looper pedal does. This kind of effect allows you to record a riff, melody, or any kind of audio you throw at it, and it stores it in its memory. Then, you can assign a button, or, most commonly, a footswitch, to that pre-recorded snip, and play it back. Otherwise, it’s pretty similar to other effects pedals. 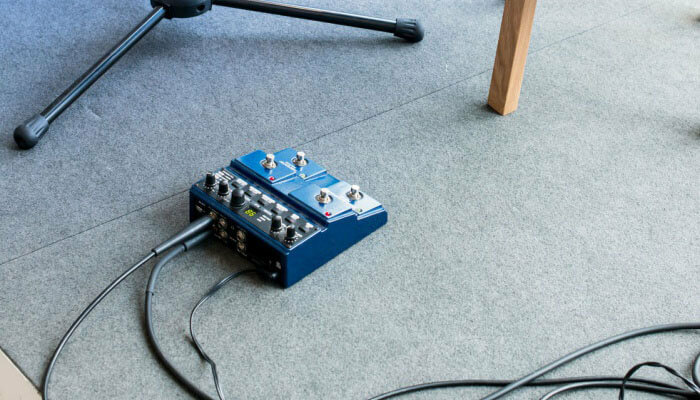 Chances are, that if you’ve clicked on this article, you already have at least a rough idea about why you would need a looper pedal. However, if you’re just curious, and want to learn a bit more about this kind of effect, don’t worry! Let’s see a couple of examples where having a looper pedal is convenient. Let’s say you’re practicing a guitar solo. While you could try and learn it to a backing track or the original song, having a loop station can make the whole process much easier. You can simply record the rhythm guitar, loop it, and have it playing in the background while you’re trying to figure out those arpeggios and sweeps. Sure, getting a pedal just practicing may not sound like a good investment, but trust me, once you find your way around using this kind of effect, experimenting with it gets interesting pretty fast. Many one-man band performers and street musicians use this kind of pedal, and for a good reason. Because you can easily put together different layers of riffs and melodies, an idea that requires multiple people can become a reality in no time. Whether you use a loop station with only one instrument, your voice, or multiple devices, you can truly make a masterpiece by combining various layers and applying different effects. 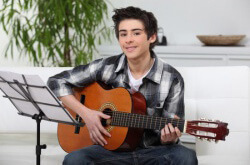 Take a look at Jacob Collier, and how he utilizes looper pedals, making music that’s at a whole new level! While this is probably the most complicated application of the looper pedal, it can lead to very interesting results. No matter what the instrument may be, as long as it can send a signal to an instrument cable, you can use it with this kind of pedal. So, even if your band only uses, for example, 2 guitars, with a looper pedal you can give your songs a whole another dimension. Whether it’s subtle and discreet effects, an additional layer of rhythm guitars, or out of the world noise you need playing in the background, a good looper pedal does it all. Just make sure that you have a good sense of rhythm, as the multiple audio layers can be pretty hard to handle, and can cause just a wall of noise, but the bad kind! You might be wondering, what is the best looper pedal I can get? The best looper pedal is the one that caters to your needs. With that in mind, let’s see the main features and specs you may want to consider given different circumstances. 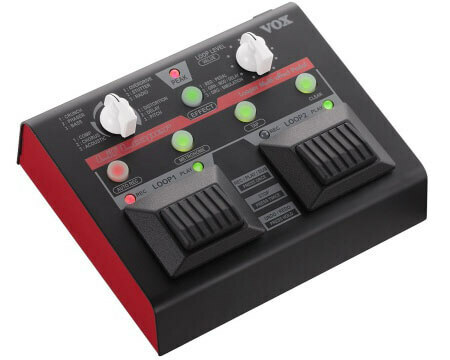 If you plan on using a looper pedal for live performances, there are a couple of things you should consider. First of all, the model you go with needs to have easily accessible controls, like footswitches. Having to bend over every time you want to use it is not only inconvenient but may get in the way of your actual performance. Other features such as an LED screen or big and bright labels all help you with finding your way around on the pedal, on a poorly lit stage. Using your looper pedal at home, either for practicing or just fooling around generally means that you don’t need anything too professional and expensive. In this case, simplicity is key, with no unnecessary bells and whistles. Most of the times, you will be able to reach down and play around with the controls without any pressure. So, if you’re looking for a straightforward looper experience, going with an entry-level budget pedal should do the work just fine! Besides these factors, there are a couple of others that play more or less an important role when we’re talking about pedals in general. You can either go compact, leaving you with more room on your pedalboard/bedroom floor, but this also means you will have to sacrifice a feature or two. 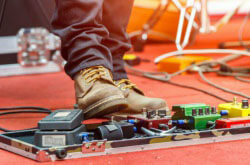 Unlike other pieces of musical equipment, pedals are used with your feet. What I’m getting at, is that a good looper pedal, and any other type, should be durable enough to last you at least a couple of years. No matter how carefully and delicately you handle your equipment, a flimsy and cheap pedal will inevitably break. Unlike other pedals, looper pedals get stepped on and used with your feet much more. So, if you’re not on a really tight budget, you should look for pedals made of metal, that utilize high-quality components and materials. While all of the previously mentioned factors are definitely important, unfortunately, the price can often be a dealbreaker. So, you might be wondering, how much does a good looper pedal cost? While there isn’t a definite answer to this question, we will go over some of the best models coming from various price ranges, so you can choose in accordance with your actual budget! Okay, we’ve gone over the basic specs and features that are important when buying any type of effects pedal. But what makes one looper pedal model stand out from the rest? What can you expect from the best looper pedals on the market? This is a very important feature if you plan on using a looper pedal on stage. Basically, the more footswitches you’ve got, the more individual loops you have at your disposal. Some models with other built-in effect utilize the different switches for operations such as toggling the effects on and off. However, there are even some models that have only one footswitch but offer a feature of connecting additional ones for a more smooth user experience. Do have in mind that you will have to factor in that extra cost! Most entry level and inexpensive looper pedals only give you the ability to play one loop a time. If you spend a little bit of extra money, you can get a model that features multiloop, meaning more than one loop can be played simultaneously. Building an entire song around a looper pedal definitely requires a pedal that has this feature, so if that’s your main goal, make sure you get the appropriate model. While this feature may be considered as more of a gimmick by some, it can be useful in certain situations. It gives you the ability to record a sample, and have the pedal play it back in reverse. Pretty straightforward. There were only a couple of older pedals that offered this feature, but newer models have it in most cases. So, if you’re all about making and using crazy sounds and effects, definitely consider this feature. As the samples you feed into the pedal need to be stored for a certain period of time, memory is an important factor you should consider. Of course, all models have a certain amount of memory built-in, but if you want to record either multiple samples or really long ones, having not enough memory can be an issue. There are many looper pedals on the market now that offer SD card expansion or even a USB connection for external drives. Memory also dictates the quality of the sample, as sound files of higher quality take up more space. While most other pedal types have your standard mono output, some chorus and looper pedals give you the ability to use a stereo output for a more emphasized effect. This can come in handy on stage, as well as in a recording studio if you plan on using actual pedals and not effects in your DAW. Dual inputs can be very practical as well. You can then easily use two instruments, or an instrument and microphone, and use the looper with both inputs at the same time, or separately. In terms of one man band performances, it’s pretty much a must-have. Otherwise known as MIDI Synch, this feature allows you to sync your loops with MIDI devices. This is once again very convenient when you’re playing alongside your band, or simply use MIDI devices for your performances. Do note that this feature is still pretty new, and there are not many models that support it. Now that we’ve got all the specs, features, and details covered, it’s time to take a closer look at the best looper pedals you can find on the market! 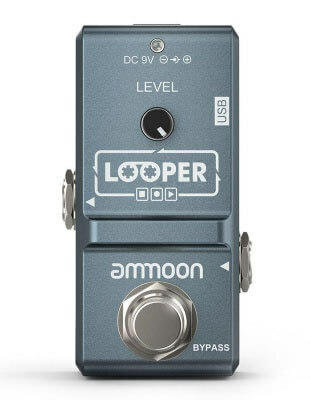 Starting out with the AP-09 Nano Loop by Ammoon, we have the best cheap looper pedal on the market. For just under $50, you get a surprisingly good effects pedal for your pedalboard. First of all, Ammoon is not a brand that’s considered popular. 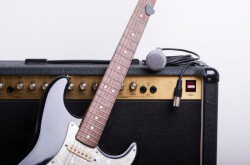 They make all sorts of musical equipment, from dirt cheap guitars, stands, cables, and everything else that falls into the category of instruments and related accessories. With that in mind, you can’t really expect much from the Nano Loop. However, if you’re looking for the cheapest possible looper pedal, definitely consider getting this one. While the design is pretty basic, the aluminum alloy that’s used for the body feels pretty solid. In terms of the actual interface, there is only one knob and one footswitch on the top of the pedal. Given the ridiculously small size of the device, you couldn’t fit anything else anyway! The whole thing is slightly longer than your average cable jack, so you can pop it in your pocket if you already have a crowded guitar bag. The single knob is used for adjusting the level, or the output volume of the pedal, while the rest of the features are controlled via the footswitch. With the AP-09, you can record up to 10 minutes of loops. This was pretty surprising, as there are some pedals that are more expensive, yet offer only up to 5 or 6 minutes of memory. This is definitely a nice advantage to have, especially considering the low price. Overdubbing is pretty much unlimited, and via the footswitch, you can easily undo, redo, and delete any loops you’ve recorded previously. The small LED light on the top tells you in which mode you are currently, so you don’t end up accidentally overwriting previous loops. You can even connect this pedal to your PC/Mac, and import or export .wav samples! As one of, if not the cheapest looper pedals you can find online, the AP-09 Nano Looper by Ammoon definitely has some surprisingly convenient features. However, it’s pretty limited to practice session/songwriting use. 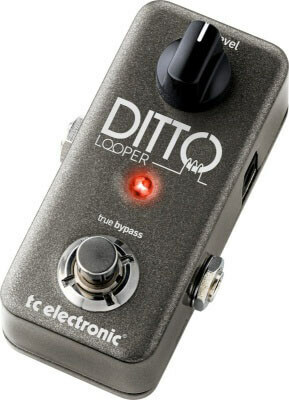 Next, we have the Ditto Looper by TC Electronic. This is probably the best budget looper pedal you can get that’s definitely worth the money! Coming from TC Electronic, it’s pretty clear that you’re getting great quality, both in terms of build and audio performance. The compact form factor coupled with a strong metal body makes the Ditto very convenient and durable. You can fit it on pretty much any pedalboard, and you’ll still have enough room for other effects. It’s pretty clear by the one footswitch on this pedal, that it mainly focuses on guitarists that either want a straightforward looper pedal on stage, or a simple little addition to practice sessions. However, do keep in mind that it may be too small to be used on stage, as hitting that small footswitch on a dimly lit stage can be quite a challenge. Basically, that’s what the Ditto Looper is all about, simplicity and efficiency. Whether you’re a beginner guitarist, or a newbie in terms of effects pedals, this model is probably the best compact looper pedal you can get. You’ve got 5 minutes of recording time, so anything from subtle effects to whole riffs or even songs can be recorded on this bad boy. Unfortunately, you can’t save any loops on it, so it’s not great for one man band applications. You can, however, overlay numerous samples one over the other, and the quality of the audio stays at a surprisingly high level! So, is the Ditto Looper worth the money? If you’re looking for the best simple looper pedal, definitely! Coming up at number 3, is the Loop Core by Nux. Nux is one of those companies that just isn’t limited to making only music-related products. However, that doesn’t mean that their effects pedals and processors aren’t good! Starting with the build quality, the Loop Core doesn’t disappoint. It’s pretty much at the same level as most other, “brand-name” pedals you can find in this price range. The first things you’ll probably notice are the dual inputs and outputs this pedal features. As we’ve previously discussed in the “Buying guide” section, this can be a very useful feature, especially if you plan on using 2 instruments with this effect. The additional output gives you the ability to connect to a stereo rig down the chain, for that extra depth effect. The fact that the Loop Core boasts up to 6 hours of recording time makes it one of the best looper pedals for live use if you’re all about that one man band thing. Sure, you may only have one footswitch at your disposal, but with this much memory on board, you can easily pre-record all of the rhythm guitars or bass lines in your songs, and play the rest live over that. Importing and exporting previously recorded loops is very easy, and is done via a USB cable. Feature-wise, the Loop Core is full of handy surprises. Firstly, there are loads of different drum patterns pre-recorded on the pedal, so you can use those alongside the tap tempo feature. While the single footswitch is used for the main operations such as record start/stop and tap tempo, while the rest is done via a couple of buttons and a knob. Sound-wise, the Loop Core performs pretty nicely, with the sound staying on point and natural, even after layers of different effects being applied. So, if you’re searching for a relatively inexpensive looper pedals that offers much more than most other competitive models in this price range, definitely consider getting the Loop Core by Nux. With all of the features it offers, it’s probably the best looper pedal for bass as well, given the fact that it has tap tempo and pre-recorded drum beats. Digitech is known for making some of the best selling effects pedals and processors for quite some time now. How does their JMEXTV JamMan looper pedal compare to the others in this review? While the JamMan is somewhat of an entry-level looper pedal, it manages to compete with more expensive, competitor models. Whether you’re a beginner or a more advanced guitar player, chances are that the JamMan will give you a pretty satisfying and productive experience. The build quality is at a pretty good level, meaning you can count on this pedal to last you a fairly long time. The one knob on the top is not only quite bulky but feels solid and precise. The JamMan features only one footswitch and one knob, used for controlling the actual level of the pedal. Unlike most other models, this one has 3 LEDs that let you know which mode you’re in currently. Like the previously mentioned Loop Core, the JamMan offers dual inputs as well as outputs, making it yet another great choice for anyone looking to experiment with looping more than one instrument. 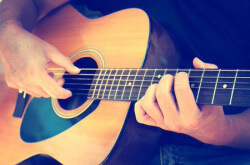 You’ve got up to 10 minutes of looping time, which should be enough for most guitarists out there. Unlimited overdubs and undo and redo are, of course, featured. But why should you get this model over so many others in this price range, that offer additional specs and features? Well, the JamMan boasts true bypass, as well as a much cleaner and natural-feeling sound. It’s probably the best sounding looper pedal you can get, that still has pretty neat features at the same time. The JamMan by Digitech gives you the neat abilities of a good looper pedal while maintaining a high level of audio quality and clarity. A simple and effective pedal that’s definitely worth checking out. 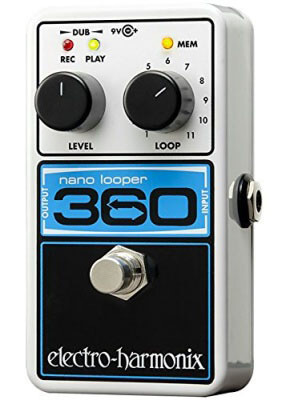 At number 5, we have the 360 Nano Looper by Electro-Harmonix. Like the name suggests, this pedal is pretty small, and with its features, it’s probably the best looper pedal for practice sessions. Starting with the build quality and design, you’re getting that well-known Electro-Harmonix sturdiness. The body is metal of course, and the knobs are big and precise. The Nano Looper will definitely last you a long time if you treat it well. I/O-wise, this model is pretty simple, with only an input and output, much like most other pedals tend to have. The controls while pretty simple, offer a very pleasant user experience. Making it to do exactly what you want is easy and intuitive. As far as the knobs go, you’ve got level and loop controls, with the latter being responsible for switching through the 11 available banks. The “360” part of the name suggests that you have 360 seconds of loop time at your disposal. You can divide that time any way you want through the 11 banks. The fact that cycling through the individual banks requires you to bend down and use the knob makes this pedal not that practical for performing live. But, if you’re looking for the best looping pedal for home use, the Nano Looper may just be your best option. Overdubbing sounds great, and the two LED lights on the top of the pedal let you know which mode is currently active. If you’re looking for a simple yet effective good loop pedal for home practice sessions, definitely consider getting this model. Vox is mostly known for their great sounding amps. However, their VLL1 looper pedal shows that they definitely know a thing or two when it comes to effects pedals! While the design makes it look pretty bland, the interface is pretty intuitive and easy to use, even if you have no experience with this kind of equipment. You finally get not 1, but 2 footswitches which are used for looping on 2 separate banks. It’s clear that the VLL1 focuses on live performances, whether it’s alongside a band or as a solo artist. This is probably the best multitrack looper pedal in this price range. This model, unlike the others we’ve mentioned so far, offers much more than your regular old looper pedal. Although you get only one input, there is a handy little switch on the back of the device used for toggling between instrument and microphone mode. This changes the input type from unbalanced to balance, to cater to the signal specs of the different devices. Overdubbing, undo, and redo functions are all features, with an addition of a pretty convenient option called Quantize. This allows you to create new recordings within a manually set length, and synch the separate loops to a previously set tempo. The one on the right controls the level of the loop in the mix. The left one is used for choosing from the 12 built-in effects. The effects include your standard ones such as overdrive, distortion, delay, pitch, phaser, etc. While they sound pretty decent, the fact that you use the one knob for both selecting them and applying different levels of them is kind of quirky at times. The sound you get is pretty good but is of noticeably lower quality than what you’d get from more expensive models. 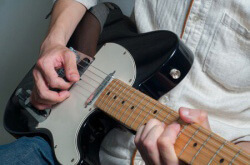 If you’re a beginner or a slightly more advanced guitarist, this shouldn’t be a big deal. For around $150, the VLL1 by Vox offers somewhat of a basic yet effective looper pedal experience. If you tend to use effects often and find having an extra footswitch to be useful, definitely check this model out. Many guitarists and other musicians think of Boss when someone mentions effects pedals, and for a good reason. This company is known for making some of the best selling pedals for quite some time, and their RC-3 Loop Station is no exception. The art of cramming loads of useful features and amazing specs in a relatively small device is what Boss excels at. Like most other Boss products, the RC-3 is built to cater the needs of traveling musicians, feeling very sturdy and utilizing high-quality components. In terms of connectivity, this pedal offers both dual outputs as well as inputs. This means you can use 2 instruments with it at the same time, and connect to stereo-supporting devices down the equipment chain. It’s because of that feature many users find the RC-3 to be the best looper pedal for guitar and vocals. Connectivity doesn’t end there. You can plug a USB cable to this pedal, and transfer .wav audio files to and from it if you feel the need to use 3rd party samples and loops. The internal memory offers up to 3 hours of loop recording, at stereo quality of course. Another useful feature is the tap tempo, which allows you to manually set the tempo of your pre-recorded loops. On the back, there is an AUX input, for connecting any other 3.5mm compliant device. Much like other pedals, all of the recording-related controls are executed via the footswitch. A dual knob alongside 5 buttons is used for cycling through the memory banks, setting the rhythm, and all the other parameters. The RC-3 by Boss definitely packs a bunch of useful features in a sturdy little device. Unfortunately, cycling through the different banks still requires you to use your hands, making it inconvenient for use on stage. All things considered, the RC-3 is probably one of the best guitar looper pedals for musicians who like to tinker around with different parameters and features. 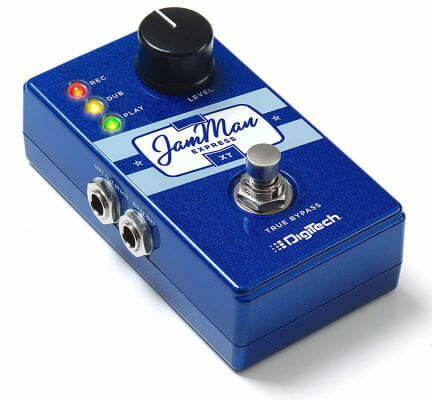 Coming up at number 8, we have the JamMan Stereo Looper from Digitech. This model is considered as the more advanced version of the JamMan Express we’ve mentioned already in this article, focusing more on the needs of professional and touring musicians. Once again you get that amazingly sturdy and long-lasting body, that’s able to take quite a punch. The all metal construction alongside top-notch switches and knobs makes the JamMan Stereo Looper a worthy addition to any touring musician’s equipment list. In terms of sheer range of features and performance, this model may just be the best looper effects pedal on the market. Let’s see what exactly it has to offer. With up to 35 minutes of onboard memory, you can record and loop pretty much anything that comes to your mind. If, however, that’s not enough, you can always pop in an SD card for 16 more hours! Finding your way through all those loops can be pretty hard, so Digitech included a neat software pack to make it easier. As the JamMan has 2 instrument and one XLR input, you can use it with any instrument/mic you want. The output is stereo as well, with additional footswitch and AUX inputs, and a rhythm and headphone output. A definite winner in terms of connectivity! Tap tempo is featured as expected, as well as the very neat reverse function, which plays your loops in reverse. 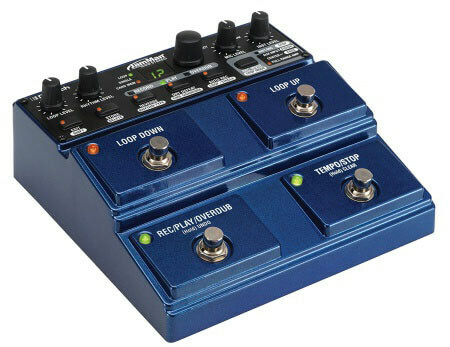 With 4 footswitches at your disposal, the JamMan Stereo Looper is the best guitar loop station you’d want to have on stage. Switching between various loops is amazingly easy, and you can control the tempo of the playback without having to bend down. The rest of the controls include separate mic/instrument loop levels and the rhythm effect. The JamMan Stereo Looper is a powerhouse of a looper pedal. 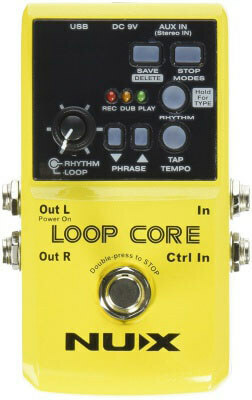 Need a reliable and convenient looper to use on stage? Look no further than this bad boy. 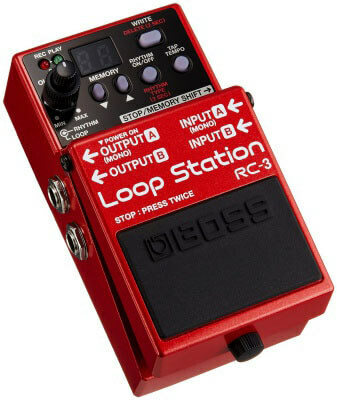 And finally, at number 9, the Boss RC-300 Loop station. Compared to this model, all the other ones look like toys. However, with a high price point and a wide range of features, this pedal definitely focuses on professionals, so the difference is justified. While it’s the most expensive one on the list, you definitely get what you paid for. As it’s the size of a whole pedalboard, it will probably take up most of the space you have, whether it’s in your practice studio or on stage. The control layout is basically separated into 3 channels. Each of the channels has 2 footswitches, with one being used for recording and playback, and the other for stopping the playback. Each of the channels also has a dedicated fader, for an additional level of control over them. Besides the 6 footswitches dedicated to the channels, there are two more, one for playing all 3 channels at once, and one Loop FX switch. Loop/recording time you get with the RC-300 is up to 3 hours, more than enough for a whole album or two you can store on this beast of a pedal. USB connectivity for sample import/export is available, as well as 16 built-in effects. That being said, the RC-300 is more of a guitar processor than just your extended looper pedal. On the far right-hand side, there is even an expression pedal, that has various applications depending on which effect is currently active. Input/Output-wise, you have a whole myriad of connections. An XLR, stereo instrument, as well as an AUX input. This is also the only model which supports MIDI synch! The RC-300 Loop Station pretty much has it all. Definitely ask yourself if you truly need all of the features it has to offer before deciding to go with this model. So, as you’ve had the chance to see, there are so many different looper pedals on the market, ranging from budget ones with simple features, to more advanced ones with loads of unique and convenient specs and options. In order to keep things simple to the very end, let’s take a look at some of the best looping pedals from different price ranges and categories. Sure, this may be the only model that costs less than $50, but it’s still one of the best looper pedals you could get if you’re on a really tight budget. With up to 10 minutes of recording time and the ability to import and export your loops via a USB cable makes it very convenient and fun to use. This was a tough one, as it really depends on what exactly you’re looking for. Personally, I found the JamMan Express as the winner in this category, mostly because of the noticeably higher level of audio quality it provides. It’s amazingly simple to use as well, so it’s great for beginners. While this model is pretty limited in terms of features it has to offer, once again, the build and sound quality just make it stand out from the rest. With 11 separate banks and 360 seconds of loop time, the Nano Looper is the best guitar looper pedal in this price range. This one was tough as well, choosing between the RC-3 and the Vox VLL1. I went with the RC-3 purely because it had a stereo input. Sure, some of you will find that having 2 footswitches and one input is more convenient, but all things considered, I think the RC-3 is a better option. This model is without a doubt the best loop pedal for guitar you could get without spending way too much money. If you feel like you need something extra, but aren’t really a professional musician, the JamMan Stereo Looper is the way to go. That pretty much wraps our article on the buying guide and best loop pedal reviews! I hope that you found it informative and that it helped you in choosing the right model for your particular needs.